René Guénon was one of the most prominent defenders of traditional metaphysics and philosophy of science in the 20th century, he was a prolific writer whose writings have made a deep impact on many intellectuals and writers in the West and the East. He published seventeen books during his lifetime, and at least eight posthumous collections and compilations have since appeared. René Guénon was born in Blois in France in 1886. The son of an architect, he grew up in a strict Catholic environment and was schooled by Jesuits. At school he excelled in philosophy and mathematics and as a young man he eventually moved to Paris to take up studies in mathematics at the College Rollin. This subject remained a lifelong interest, and a few years before his death he published a short mathematical treatise, 'Les Princips du Calcul Infinitéstimal'. However, his energies were soon diverted from academic studies and in 1905 he abandoned his preparation for Grandes Écoles. For the next seven years, seized by what Anatole France called ‘the vertigo of the invisible’, Guénon submerged himself in fin-de-siécle French occultism. Guénon’s involvement in the occultist underground seems to have been somewhat indiscriminate. As well as playing a leading role in the ‘gnostic’ groups, Guénon was also involved in theosophy, spiritualism, and masonry. From the vantage-point of Guénon’s later work this was a murky and bizarre period of his life, one of which he apparently did not care to be reminded. Indeed, he was to become one of the most ferocious critics of these occultist movements. Nevertheless, Guénon learned a good deal in this period and his preoccupations and general orientation retained something of the stamp of fin-de-siécle occultism in the sense that "Most of the occult groups turned to the archaic past in search of authentic spiritual values against which modern civilization could be measured and found wanting" as Whithall Perry had observed. Occultism provided a framework for the repudiation of the bourgeois ideologies and institutions of the day. Involvement with the occult represented for the French literary and artistic avant-garde one of the most efficient criticisms and rejections of the religious and cultural values of the West—efficient because it was considered to be based on historical facts. Later Guénon was to disown the philosophical and historical assumptions on which such movements were built, and to contrast their ‘counterfeit spirituality’ with what he came to see as genuine expressions of traditional esoterism, stimulating a study of ancient esoteric traditions in Egypt, Persia, India, and China, and directing attention toward the sacred writings of the East. Precisely how Guénon came to a serious study of Taoism, Hinduism, and Islam remains unclear, but it seems likely that it was through his involvement in one of the occultist groups. Thus by the time he was nearly 30, Guénon's phenomenal intelligence had enabled him to see exactly what was wrong with the modern West, and that same intelligence had dug him out of it altogether. Among the ills which he saw all around him he was very much preoccupied with the general anti-religious prejudice which was particularly rife among the French so-called intelligentsia. He was sure that some of these people were nonetheless virtually intelligent and would be capable of responding to the truth if it were clearly set before them. This anti-religious prejudice arose because the representatives of religion had gradually become less and less intelligent and more and more centered on sentimental considerations. In the Catholic Church especially, where the division of the community into clergy and laity was always stressed, a lay figure had to rely on the Church, it was not his business to think about spiritual things. Intelligent laymen would ask questions of priests who would not be able to answer these questions and who would take refuge in the idea that intelligence and pride were very closely connected. And so it is not difficult to see how this very anti-religious prejudice came into being especially in France. in disavowing the principles [of traditional metaphysics and cosmology] and in refusing to attach itself to them, robs itself both of the highest guarantee and the surest direction it could have; there is no longer anything valid in it except knowledge of details, and as soon as it seeks to rise one degree higher, it becomes dubious and vacillating. Although Guénon always kept a cloak of secrecy wrapped tightly around his own spiritual life it was certainly during this period that he embarked on a serious study of sacred doctrines which eventually lead him to Islam. It has often been asserted that Guénon converted to Islam in 1912 but this is yet to be supported by incontrovertible evidence. Such may have been the case, but some scholars have argued that Guénon’s personal sympathies, and perhaps his formal affiliations, belonged to the Roman Catholic Church in the years between about 1912 and 1928, and that his formal conversion to Islam did not come until Guénon moved to Cairo in 1930. In either case it can be said that Guénon’s life certainly entered a new phase in 1912, one marked by his marriage to a devout Catholic. The years 1927 to 1930 mark another transition in Guénon’s life, culminating in his move to Cairo in 1930 and his open commitment to Islam. It was after Guénon’s wife died rather abruptly in January 1928 and, following a series of fortuitous circumstances, that he left on a three month visit to Cairo. He was to remain there until his death in 1951. In Cairo Guénon was initiated into the Sufic order of Shadilites and invested with the name Abdel Wahed Yahya. He married again and lived a modest and retiring existence. 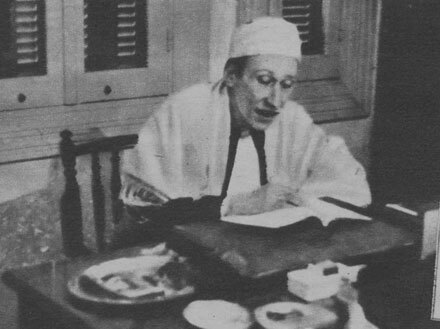 Such was his anonymity that an admirer of his writings was dumbfounded to discover that the venerable next door neighbor whom she had known for years as Sheikh Abd al-Wahid Yahya was in reality René Guénon. 'When I read the books of Guénon in the early thirties it was as if I had been struck by lightning and realized that this was the truth.... I wrote to Guénon. I translated one of his first books, East and West, into English and I was in correspondence with him in connection with that. In 1930 Guénon left Paris, after the death of his first wife, and went to Cairo where he lived for twenty years until his death in 1951. One of my first ideas upon reading Guénon's books was to send copies to my greatest friend who had been a student with me at Oxford, because I knew he would have just the same reaction as I had. He came back to the West and took the same way that I had already found, a way of the kind that Guénon speaks of in his books. Then being in need of work he was given a lectureship at Cairo University, and I sent him Guénon's poste restante number. Guénon was extremely secretive and would not give his actual address to anybody; he wanted to disappear. He had enemies in France and he suspected that they wished to attack him by magic. I do not know this for certain but I know that Guénon was very much afraid of being attacked by certain people and he wished to remain unknown, to sink himself into the Egyptian world where he was, the world of Islam. And so my friend had to wait a long time before Guénon agreed to see him. But when the meeting finally took place Guénon became immediately attached to him, and told him that he could always come to his house whenever he liked. In the summer of 1939 I went to visit my friend in Cairo and when I was there the war broke out. I had a lectureship in Lithuania at that time and, being unable to return there, I was forced to stay in Egypt. My friend, who had become like a member of Guénon's household, collecting his mail from poste restante and doing many other things for him, took me to see Guénon. A year later I was out riding in the desert with my friend when his horse ran away with him and he was killed as the result of an accident. I shall never forget having to go to tell Guénon of his death. When I did he just wept for an hour. I had no option but to take my friend's place. I had already been given the freedom of the household and very quickly I became like one of the family. It was a tremendous privilege of course. Guénon's wife could not read and she spoke only Arabic. I quickly learned Arabic so I was able to talk to her. It was a very happy marriage. They had been married for seven years without children and Guénon, who was getting fairly old -- he was much older than she was -- had had no children with his first wife, so it was unexpected when they began to have children. They had four children altogether. I went to see Guénon nearly every day. I was the first person to read The Reign of Quantity, the only book he wrote while I knew him since the other books had all been written earlier. He gave it to me chapter by chapter. And I was able also to give him my own first book when I wrote it, The Book of Certainty, which I gave him also chapter by chapter. It was a very great privilege to have known such a person. Guénon almost never went out except when he came to visit us. I would send a car to fetch him and he would come with his family to our house about twice a year. We lived at that time just near the pyramids outside of Cairo. I went out with him only once and we went to visit the mosque of Sayyidnâ Husayn near al-Azhar. He had a remarkable presence; it was striking to see the respect with which he was treated. As he entered the mosque you could hear people on all sides saying, 'Allâhumma salli 'alâ Sayyidnâ Muhammad,' that is, 'May God rain blessings on the Prophet Muhammad', which is a way of expressing great reverence for someone. He had a luminous presence and his very beautiful eyes, one of his most striking features, retained their lustre into early old age. As I have said, Guénon did not like to talk about himself and I respected his reticence, I did not ask him questions and I think he was pleased with that. To sum up what his function was, one might say that it was his function, in a world increasingly rife with heresy and pseudo religion, to remind twentieth century man of the need for orthodoxy which itself presupposes firstly a divine intervention, and secondly a tradition which hands down with fidelity from generation to generation what Heaven has revealed. In this connection we are deeply indebted to him for having restored to the world the word orthodoxy in the full rigor of its original meaning, that is, rectitude of opinion, a rectitude which compels the intelligent man not merely to reject heresy, but also to recognize the validity of all those faiths which conform to those criteria on which his own faith depends for its orthodoxy.